Ultra exclusive pair of GIA certified greenish blue Paraiba Tourmaline pear shapes, weighing a total of 6.26 carats, are set in these magnificent 1.53 carat diamond earrings. Crafted by extremely skilled hands in the USA. Approximately 1.1 inches in length. GIA certificate attached. Signed Merkaba. ***Returns are accepted within 7 days of delivery and will gladly be paid by us. Showcasing a cluster of round brilliant diamonds set in a pear shape design, suspended on an accented leverback made in 18 karat white gold. Diamonds weigh 1.13 carats total. 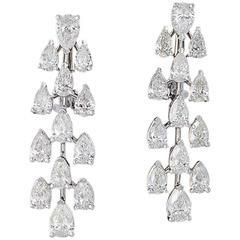 An elegant pair of diamond dangle earrings. 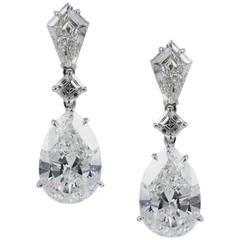 5.28 carats of G VS pear shaped diamonds set in 18k white gold. Approximately 1.35 inches in length.